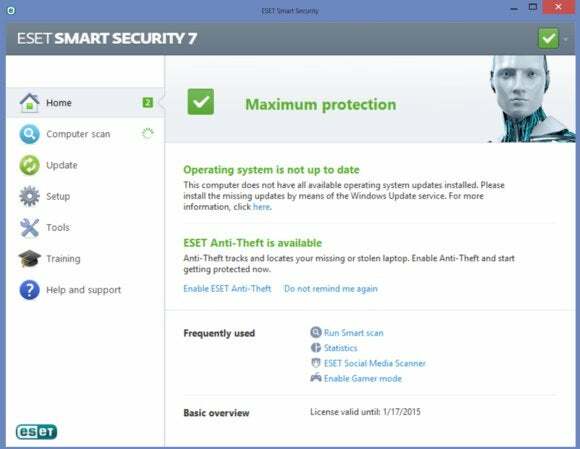 Eset Smart Security 7 ($60 for one year of protection on one PC) is relatively new to the U.S. market. This all-in-one security suite includes antitheft protection and a social media scanner. Unfortunately, though Eset offers good protection and a fairly intuitive interface, it puts a lot of stress on your system. In our real-world (zero-day) tests, which include email and Web threats, Eset protected against 100 percent of attacks, matching the outstanding performance of F-Secure Internet Security 2014, Kaspersky Internet Security 2014, Norton Internet Security 2014, and Trend Micro Titanium Maximum Security 2014. Eset handled known malware well, too, blocking 100 percent of attacks from malware discovered in the month before testing. Eset didn’t flag any safe websites our usability tests, nor did it try to prevent actions carried out while installing and using legitimate software, or warn users about them, or identify any legitimate programs as dangerous. Unfortunately, Eset’s suite hobbles system performance. Its score of 8 tied Norton for the highest (and therefore least desirable) in our roundup; you can expect slower start-ups, and longer lags during downloads and installations with this security suite in place. During my test of Eset, my PC’s fan ran on high nonstop until I uninstalled the program. Eset Smart Security 7's interface is a mixed bag, with both touchscreen-friendly buttons and checkboxes. Eset’s installation process is a drag, too. You have to click through several screens, some of them separated by long downloads. Eset’s installer recognizes incompatible software (such as other security suites), but it can’t uninstall them directly. Instead, it asks you to go into your Control Panel and manually uninstall each incompatible program. You can skip this step, but doing so could abort Eset’s installation. Eset’s main interface has a menu on the left for the main feature categories, which include scan, update, setup, tools, training, and help and support. A home screen shows you your protection status (a banner at the top displays “Maximum protection” in green when you’re fully protected) as well as any notifications or alerts. Though Eset’s left menu is touchscreen-optimized, the setup menu isn’t: Each setting ties to a drop-down menu that lets you disable certain features for a fixed amount of time. A link at the bottom of the setup menu takes you to Eset’s advanced settings, which are even less touchscreen-friendly, with lots of nested menus and tiny checkboxes. The program does a pretty good job of explaining confusing terms and settings in plain English. Eset has some nice features for newbies. The training link in the left menu takes you to videos, slides, and information about Eset’s security suite and about online security in general. Eset Smart Security 7 offers very strong protection, and it’s a great choice for beginners—if you can accept the toll it takes on your system’s performance. 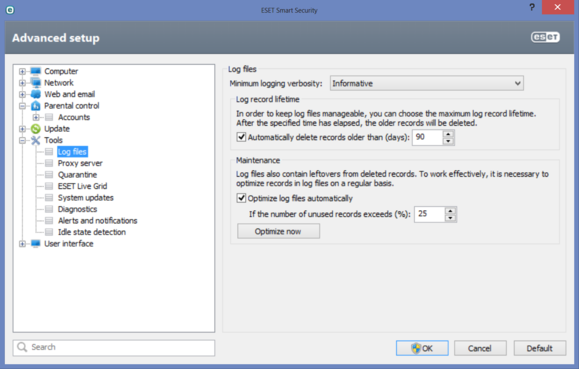 Eset Smart Security 7 offers great protection if you can tolerate the drag it puts on your system.